MVASGA calls Jefferson Park east of New Haven, IN "home." Most of the meetings and club activities occur here. 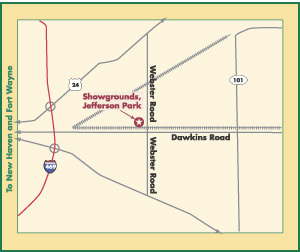 Jefferson Township Park is located 4 mi. East of New Haven, IN. Take U.S. Hwy 30 East from New Haven to Webster Road. Turn North (left) on Webster Road. Unlimited camping area, limited electrical hookup, food and showers available on the grounds.